Seventy% is a world leading authority on fine chocolate, founded in London in 2001. Our aim is to raise awareness of the quality and origin of the chocolate we eat. Seventy% is now one of the principal online resources for fine chocolate, with over 600 reviews of more than 350 chocolate bars, an active forum community that includes leading professionals from around the world, and an online magazine and feature section. We aim to change the world’s taste for chocolate, one slow bite at a time. Martin Christy is one of the world’s foremost experts on chocolate tasting and is a leading voice in the fine chocolate industry, working to promote and preserve fine chocolate and fine cacao and support producers in both sectors. He is a teacher of chocolate tasting for professionals, consumers and the cacao sector and is a co-founder of the International Institute of Chocolate and Cacao Tasting. 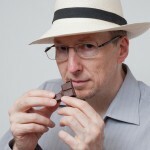 Martin is Awards Director and Head of the Grand Jury of the International Chocolate Awards, Chair of the fine cacao and fine chocolate industry association Direct Cacao, is Vice-president of The Chocolate Way, a European cultural route for chocolate, and is a member of the Heirloom Cacao Preservation InitiativeTasting Panel and the jury of the Cocoa of Excellence. Martin is also a freelance writer for UK magazines and web publications, and has contributed to several books about fine chocolate. Martin is behind Seventy%’s experiential approach to ‘Slow Chocolate’. To get in touch with us, please use our online contact form and we’ll get an email right away. As one of the most comprehensive chocolate sites in the world, Seventy% brings consumers, professionals and industry producers together as a community to learn the finer distinctions of cacao and chocolate and the importance of a direct connection from ‘bean to bar’. In doing so it helps support the continued growth and development of the fine cacao and chocolate market, from the ground up. Seventy% also runs experiential chocolate events for consumer and corporate clients and our Slow Chocolate series of workshops, which will help develop your connoisseur chocolate senses.